Single Sided Deafness (also called unilateral hearing loss) is the loss of hearing in one ear and is more common and more troublesome than most people realise. It’s typically caused by viral infections, Meniere’s disease, head or ear injuries, or as a result of surgical intervention to remove brain tumours. The symptoms of unilateral hearing loss vary. The most common symptom is an inability to separate background noise from the sounds you want to hear. In addition to the loss of hearing in one ear, some people have difficulty determining the direction of sounds. This can make it dangerous in situations where being aware of the location of sounds is important – such as crossing a street. Effective treatment options available to people with Single Sided Deafness are readily available and can either include a Contralateral Routing of Signals (CROS) device or a Bone Conduction Implant. A CROS device uses a microphone on the ear side with a hearing loss to detect the sound and transmit it to another device on the ear with better or normal hearing. These devices are effective in improving the ability to hear sound in all directions. Most systems are now wireless and are either behind the ear or custom style hearing aids. Kevin is 84 years old. When he was 25 years old, a virus infection attacked his right ear and left him with no useable hearing in that ear. Kevin’s hearing in his left ear also deteriorated to a moderately severe degree. 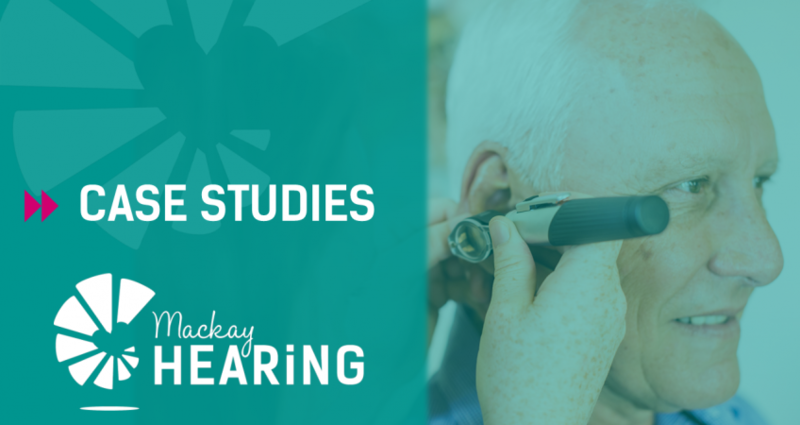 With the additional effects of industrial deafness, hearing in his left ear began to deteriorate to a point that hearing aids no longer provided effective assistance. Kevin found social situations difficult. Before treatment from Mackay Hearing, he recalls attending a function where a lady asked his wife “does it speak?” – a hurtful inference that he was stupid. Kevin was first fitted with hearing aids from another clinic when he was 74 years old with limited success in his poorer hearing ear. Despite upgrading his hearing aids with high quality and latest technology, he could hear but always had difficulty understanding conversations. Kevin’s hearing status, symptoms and history prompted consideration of alternate solutions, and a trial of a wireless CROS device was undertaken. Kevin’s trial of the wireless CROS device was an outstanding success. Kevin reported being able to hear conversations much more effectively and he had gained new-found confidence at social gatherings. “I can now hear & understand & join in conversations, & more importantly, I can converse with my wife. The CROS device has changed my life!”.